Reflux extraction is the least expensive method for determining asphalt content in bituminous pavement mixtures. 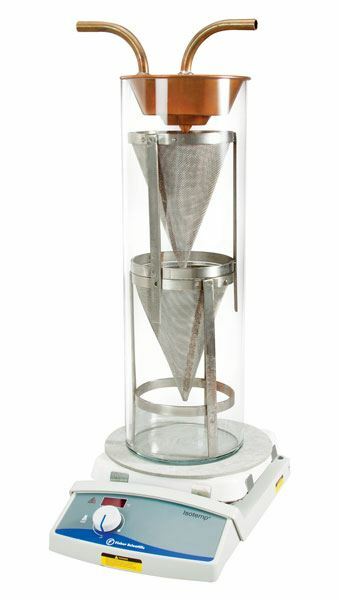 Hot plates generate solvent vapor that passes around and through sample contained in two wire mesh cones lined with filter paper. Reflux solvent condensing on the water-cooled condenser percolates through the sample repeatedly until the bitumen is extracted. HM-5 and HM-6 Reflux Extractors are offered in nominal capacities of 1,000g and 2,000g and include a Hot Plate, Extraction Jar, two interlocking wire mesh Cones with bail handles, copper Condenser with water inlet/outlet tubes, Filter Paper, Insulating Pad and instructions.